In this week’s blog we thought we’d write a bit about layering and how much difference a decent set of thermals can make. This would be a good example of a poor choice of layers. Good layering will make the difference between being cold and being warm, being comfortable and being uncomfortable and, believe it or not, the difference between being damp and being dry. As you can imagine these factors all link together and ultimately decide how much you enjoy your day on the water. “But how does my thermal effect how dry my top is?” I hear you ask. Well it doesn’t, but it can effect how dry you perceive your gear to be. Have you ever gotten off the water and found an odd damp patch on your chest or back and instantly put it down to your dry-wear failing? While this can sometimes be the case, you would be surprised at how much of this dampness can be attributed to sweat. Often when paddling, particularly when it’s cold enough to justify a dry suit, paddlers will pile on the thermals, correctly trying to trap as much air as possible. While there is nothing wrong at all with layering up for the cold it is important to take into consideration a couple of other factors when choosing your insulating layers for the day. Firstly, what you’re going to be doing? What is the intensity is going to be? If I’m going on a club trip and leading a group of beginners I know that the pace will be slow and as such the intensity will be low, therefore I will wear an extra insulating layer or two. 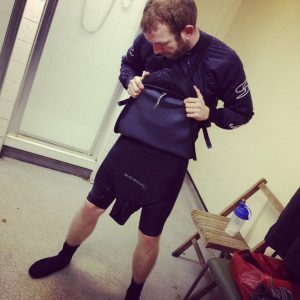 However if I was to be on more of a “peer” paddle in the exact same conditions, on a run we were familiar with, I would wear a layer or two less, often opting for a single performance layer as I know each lap will be fairly non-stop, with eddies being used more for a breather while everyone gets through a rapid. As such the intensity is high and therefore I know I’m going to be getting pretty warm. It’s the same principal as putting on a coat to walk into town but only wearing a long sleeve thermal for a jog. Of course the old adage “dress for a swim and not the weather” holds true but it’s important that you take into account your level of effort as well. Now onto what you are actually layering up with. Drysuit manufacturers are continually striving to create suits that are the best within their bracket, inovating on zip positions, shaping and taping. But one of the big things that manufacturers always strive for is the best material for their product, with a key factor often being breathability. At the put in or take out for a river we see loads of modern, breathable dry-suits but when these are then removed it’s hard not to notice the thick, not so technical, layers being worn underneath. While these layers will no doubt succeed in trapping air, a key element of insulation, they rarely allow moisture to move resulting in any moisture produced from sweat getting trapped within the garment. This is kind of like driving a sports car, but with flat tyres; you still have a sports car but you’re only getting a fraction of the performance, so what’s the point? In order to get the most out of what your drysuit has to offer it’s worthwhile ensuring that your layering works in a way that maximizes breath-ability. This is important because, as we all know, the body sweats in order to reduce your temperature. Therefore by moving moisture away from the skin you won’t find yourself rapidly cooling or feeling uncomfortably clammy, thus helping your insulating layers keep you nice and comfortable. So next to the body you will always want a good wicking layer designed to be next to the skin. The Peak UK Tecwik Long, Peak UK Tecwik Short and the Palm Arun Thermal Range are all good examples of this. Palm’s ‘Channel Flow Technology’ works spectacularly at drawing moisture to the outside of the garment as quickly as possible. Personally I’ve used both products and noticed that at the end of a paddle, when getting changed, my skin is bone dry yet the outer of my base layer felt a little damp, showing how effectively the moisture was being wicked away from the skin. Once moisture has been drawn from the skin it still needs to be able to reach the dry suit membrane in order to dissipate from within the suit. As such it is important that your mid-layer also draws moisture and water vapor from the inside of the garment to the outside. Palm use Pontetorto’s Technostretch waffle fleece material in their mid-layer Tsangpo garments – “Waffle fleece has air channels to allow excellent breathability and ventilation within the fabric, while remaining well insulating”. This is achieved by making the inner of the fabric out of polypropylene, an extremely hydrophobic material, and the outer from polyester, which is less hydrophobic, resulting in far more moisture reaching the breathable membrane of your dry-suit and escaping into the outside world. Essentially you’ll be far less of a sweaty mess by the take out. If it is particularly bitter you can always double up on these breathable mid-layers too, for instance on those super cold days I’ll wear my Tsangpo Gilet over the Tsangpo Thermal Suit for a bit of extra warmth around my core. One of the added benefits of using the Pontetorto Technostretch Waffle Fleece material is that it is has a far shorter drying time, lower dry weight and lower saturated weight than near all other materials tested and previously used to produce thermals for paddlesport. This, combined with the Polygiene anti-bacterial treatment and waffle design, results in a thermal that dries quickly and doesn’t smell while being ultimately warmer, more comfortable and thinner than what you could currently be using. WWTCC: Why did you choose Pontetorto for your thermal range? TT: Above all it is about quality. Pontetorto walk a great line between innovation and performance in the materials they produce but equally maintain a fantastic level of quality, particularly in the hand feel of the material. 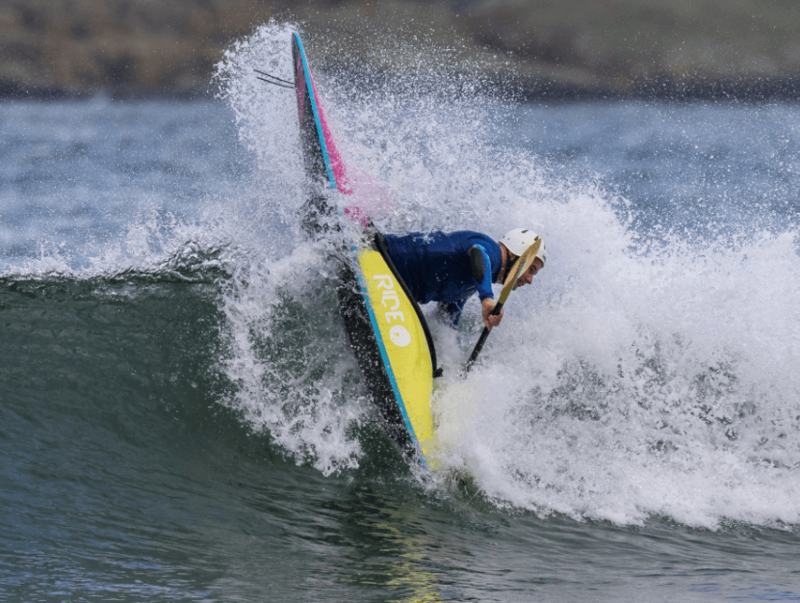 They know their stuff and we have a great relationship with them, assisting Palm to make the best choices when it comes to the material specifications chosen to meet the needs of our paddling customers. They also have great Coffee! WWTCC: How have thermals and the modern materials used in them improved over the last 10 years? TT: Weight is the main change. A modern thermal fabric like the Tecnostretch fabric Palm uses will give the same level of thermal insulation as fabrics which were double or more in weight some years ago. The obvious benefit to this being we can make layers which are much lighter to wear, with better fit and so overall a better level of performance. Also many older fabrics weren’t really constructed to let air move. So when you want to either trap air to help insulation or move moisture (sweat) then you need more sophisticated constructions and materials – such as the waffle texture on the Technostretch we use. In addition we now have access to treatments like Polygiene (a process that inhibits the build up of bacteria on the material), so you reduce the amount of times the garment needs to be washed. WWTCC: Why are Palm thermals better for paddling than something cheap I could buy from the local high street sports shop? TT: There is no denying that a cheapie thermal will do some of the work of a more expensive version. After all they are often using similar basic yarns. But when you ask those materials to wick, dry quickly or trap air to insulate they simply don’t measure up. Also a bit like cheap cotton T-shirts from Bangladesh there is a reason they are cheap. Someone, somewhere, is paying peanuts down the supply chain and as such they keep the price artificially low. So it depends on how you feel about that as a customer? At Palm the fact that our Pontetorto fabric is Bluesign certified means we know that the processes used in manufacture and the welfare of the staff involved in making it meet standards that are internationally recognised. WWTCC: Why don’t you make heavy weight thermal trousers? TT: To be honest the market for separate tops and pants is much smaller than onesies – after all who doesn’t like feeling completely toastie with no cold zones. So we’ve found that most customers go that route, or wear shorts like the Horizon. If they do want a thermal pant customers often go for a lighter layer, like an Arun. In an ideal world we would have a Tsangpo pant and if demand was there we’d make them. Previous 7 things to make you happy in 2019!